The Edinburgh Trams are the UK’s newest tramway which opened to the public on the 31st May 2014. The service operates using a fleet of 27 CAF Urbos 3 trams that provide a 10 minute frequency on the entirety of the route from York Place to Edinburgh Airport. The tramway currently stands at 8.7 miles in length and each tram is compromised of 7 articulated sections giving 80 seats and space for 252 standing passengers with a top speed of 43mph. Unlike many modern tramways across the United Kingdom, the trams feature a very high standard of interior with leather seats compared to most other tramways which have opted for cheap cloth seats. This certainly gives a much higher standard of ride quality for passengers, with the trams giving a very smooth ride. Presently the tramway is carrying 90,000 passengers each week which is certainly promising, though not overly busy with trams rarely having standing loads. However, the tramway is still in its very early days so this is to be expected with a longer time frame required to see how much patronage will increase and to ultimately determine which (or if any) extensions will be built. A variety of phases have been suggested including extending operations past York Place to Newhaven, Haymarket to Granton and Islington Park and Ride to Newbridge though none of these are currently under development. One controversial part of the tramway is the fare structure, with single tickets available for the City Zone at just £1.50 for any journey. This permits travel along every stop of the route except the airport, but if the airport is included in the journey the price then rises to £5. 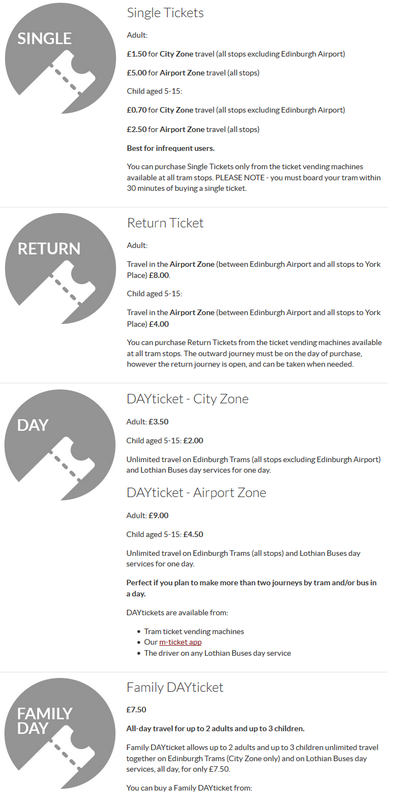 Return tickets are available only for the Airport Zone at £8, and day tickets are £3.50 for the City Zone and £9 for the Airport Zone.